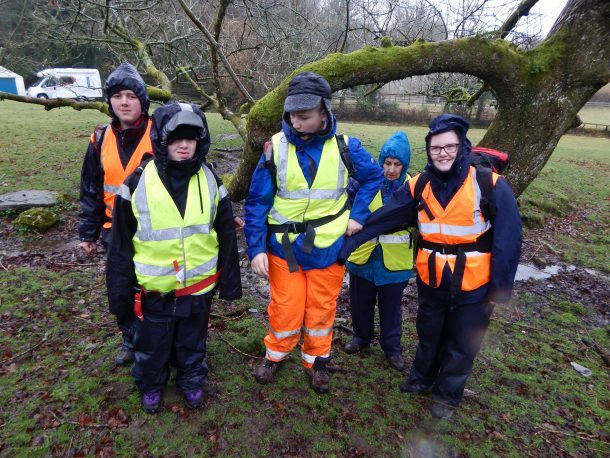 With storm Freya likely to hit late afternoon /early evening the Jubilee Challenge students, Emily, Sam, Nicole and Dylan, accompanied by Mrs Guest, Ms Owen and Ms Unwin made a prompt start to expedition 4. Starting at Whitchurch, they walked across the downs towards Pew Tor in low cloud, persistent rain and increasingly blustery winds. Along the way they took turns to lead, stopped for water breaks and in a slight lull in the weather did a survival bag exercise in which Nicole had to be placed in the bag in less than a minute. Continuing down country lanes they stopped for lunch at Langstone Manor, taking it under their survival shelter. Ms Owen decided she preferred under a laurel bush! Dylan kept a really good pace back to the Downs. Thereafter, Nicole managed to keep up with the rest of the group really well. Jumping in the minibus they took a short ride to Drake’s Café where they picked up the trail leading to Grenofen Tunnel. Here they used their torches and walked along the 300m length of what was Brunel’s 1854 railway tunnel; Sam leading the way in both directions. Reopened in 2012, it forms part of the Drake’s trail cycle route to Plymouth. Ms Owen loves it and has walked it now 3 times in the past month with Jemima and Matilda, her grown up daughters! In spite of the poor weather conditions and very soggy ground, Dylan’s moaning and tiny blister everyone did very well. All the kit is now drying and will be re waterproofed next week. Next expedition will be on March 17th at Burrator.